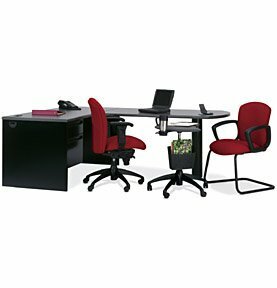 An L-shaped desk can help you use space more efficiently at your office in Alpharetta, Woodstock, Sandy Springs, or any other surrounding community in Atlanta, GA. Oftentimes, especially in smaller offices, it’s important to utilize every square inch of space. To do so, the layout of your office furniture needs to be extremely exact and well planned. If you’re looking to maximize the amount of office space you have by purchasing new, better-fitting furniture, visit our luxurious showroom in Roswell, GA. We have full displays of the furniture we sell, where you’ll be able to take precise measurements and see how our furniture will look in an office setting. Plus, we’ll be able to provide you with space-saving strategies that may help increase your workspace. When you visit NorthPoint Office Furniture to see our selection of L-shaped desk options, you’ll notice that we carry furniture from some of the most trusted names in the industry, including Cherryman, DMI, Global, HON, Martin Furniture, and other reputable brands. Our desks are also available in a variety of different finishes, including cherry, mahogany, maple, espresso, oak, and other colors, so you’re sure to find an L-shaped desk that matches the current décor of your office. Contact NorthPoint Office Furniture today or visit our showroom to learn more about purchasing an L-shaped desk, office seating, and other furniture for your business in Alpharetta, Woodstock, Sandy Springs, or any other nearby community in Atlanta, GA.